Moving Water is about art and about water. In The Netherlands money is spent and artists are asked to make works to embellish ‘dead/boring’ canals. Which is ironic since in a lot of countries in the world there isn’t even enough water for health and food. PIEK! came up with an art piece to connect these themes: enhance a dead and boring canal in Meppel and provide water for the needed, in India. With the help of Simavi we adopted a well project in Kanamanthur, India. In the meantime a big funnel shaped object was placed in the water in Meppel. 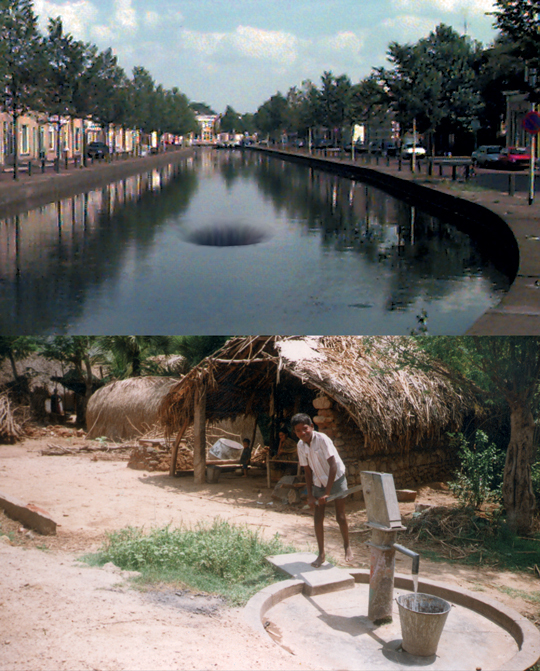 When it was daytime in India the water in Meppel flowed trough the funnel shaped object, making a big hole in the water. A negative fountain. In this way we created a connection between two locations in the world who both have a different meaning of the word ‘water’.